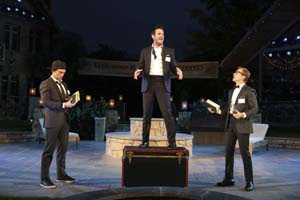 The Public has a winner in this full-out musical version of Shakespeare’s wordy early comedy, which jettisons much of the arcane text, but remains utterly true to the essence of the piece. Alex Timbers, who adapted the book and directed, and Michael Friedman, who composed the songs, have reunited after their “Bloody Bloody Andrew Jackson” success, but what they have fashioned here is more in the vein of a traditional Broadway musical, one very much in the style of the John Guare-Galt MacDermot “Two Gentlemen of Verona,” which, we’re told, served as a template for this one. And like “Two Gentlemen,” the score covers myriad genres – from rock to doo wop to Broadway -- which bubble most delightfully throughout the intermission-less 100 minutes. Reset in a New England town (a beautiful eye-filling set by John Lee Beatty, and spot-on costumes by Jennifer Moeller), the King of Navarre and his three comrades – who have sworn off women for academic pursuits -- have returned for a five-year college reunion, and the Princess of France and her entourage are young women with whom they had perhaps dallied years before. The transposition works exceedingly well. I particularly enjoyed the Russians of the final act now amusingly transformed into East German performance artists. The cast is wonderful across the board, excelling in their Shakespearean line readings as much as their musical turns. Daniel Breaker’s Navarre and Colin O’Donnell’s Berowne are outstanding, with top-notch work from Lucas Near-Verbrugghe as Dumain and Bryce Pinkham as Longaville. The women have less stage time, but Patti Murin as the Princess, Maria Thayer as Rosaline, Audrey Lynn Weston as Katherine, and Kimiko Glenn as Maria all have their opportunities to shine. The part of wench Jaquenetta has been built up and Rebecca Naomi Jones fills it beautifully, stopping the show with her “Love’s a Gun.” Rachel Dratch is very funny as a gender-bending Holofernes, and Jeff Hiller her equally pretentious sidekick Nathaniel. There’s amusing work from Charlie Pollock as the slow-witted Costard, Andrew Durand as Boyet, Justin Levine as Moth, and Kevin Del Aguila as Dull. The dialogue, though rendered with American cadences, excepting Caesar Samayoa’s hilariously loopy Spanish swain Don Armado, is delivered with consistent intelligence. Timbers’ assured direction captures just the right tone, and there’s some nifty choreography by Danny Mefford. His “Chorus Line” homage (led by Pinkham) is especially clever. The handsome production – for all its high spirits and intentional goofiness – ends on an appropriately melancholy tone, as it should. It would be a shame if the show vanished after another week. Perhaps a Broadway transfer is in the offing, even if Shakespeare can be a dicey commercial proposition. But I suspect this might have wider appeal than the teams “Bloody Bloody Andrew Jackson.” In any case, here’s hoping the score at least gets recorded. On the unpromising premise of a blind date unfolding in real time, with all of the action confined to the restaurant where a mismatched couple meet, emerges a most delightful show, and a definite crowd-pleaser. 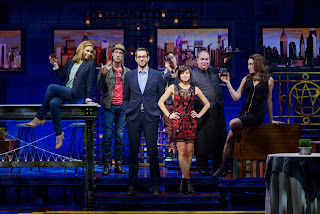 With a sharp, funny book by Austin Winsberg, amusing songs by Alan Zachary and Michael Weiner, and thoroughly engaging performances by leads Zachary Levi and Krysta Rodriguez, the pace never flags for its 95 intermission-less minutes. Though it sounds like one big cliché, Winsburg and the team have found fresh twists and the show plays like a good Neil Simon comedy with songs. Rodriguez is Casey, no stranger to blind dates, and with an unfortunate penchant for bad boys. Levi is Aaron, new to the whole routine, and still smarting over his breakup with Allison. They’ve been brought together by Casey’s sister’s husband who had a hunch they might click. Needless to say, things don’t go well, with Aaron putting his foot in his mouth at every opportunity, and Casey giving off an off-putting, abrasive vibe. Allison, the bar’s waiter and various other characters, past and present, are played by a talented ensemble of five actors (Bryce Ryness, Kristoffer Cusick, Blake Hammond, Sara Chase, and Kate Loprest) who provide running commentary (and advice) in the minds of the protagonists. Hammond’s hammy waiter, one with songwriting aspirations, is a standout, and Cusick generates laughs for his manic portrayal of Casey’s gay pal constantly calling her with “bailout” messages, in case she should need them, though the humor palls after a while. Bill Berry directs smartly, bringing out the humor and sentiment of the material. 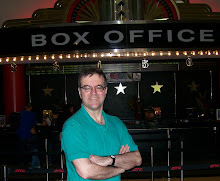 The show was originally done last year at The 5th Avenue Theatre in Seattle (co-produced by A Contemporary Theatre) where it garnered good reviews and awards. 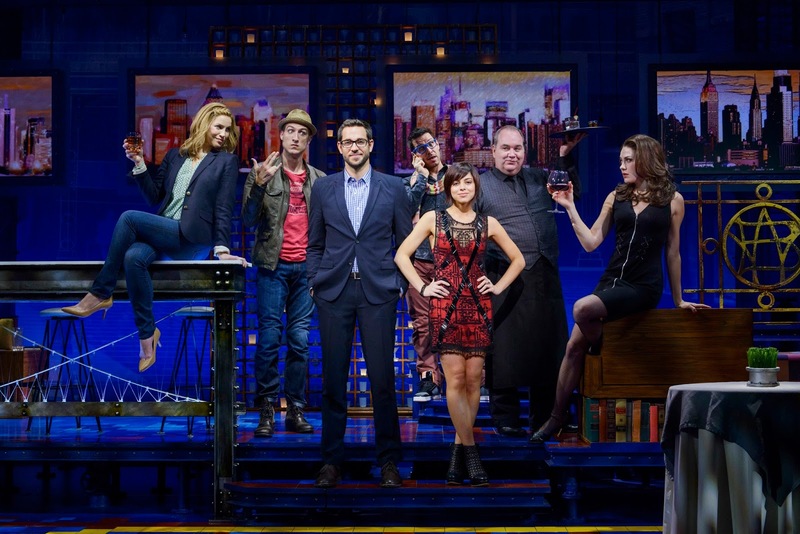 This is one of those intimate shows that could just have easily been mounted Off-Broadway, but with David Gallo’s snazzy set and projections, it looks just fine on the Longacre stage. I predict a popular afterlife in regional theater and schools.